Become an Entrepreneur! Start Up Now! I'd like to make all my readers a special offer. 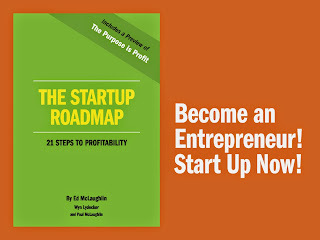 I've just had a book published that I co-authored with Ed "Skip" McLaughlin, "The Startup Roadmap: 21 Steps to Profitability." Ed bootstrapped his business, grew it into an Inc. 500 Company and sold it to a Fortune 100 Company. I've been working with entrepreneurs for 20+ years, mentoring them and writing business plans. Ed and I have put our combined knowledge and experience into this book. We are offering a complementary eCopy of the book from our website at: http://thepurposeisprofit.com/the-startup-roadmap/. The print edition is also available for $9.99 on Amazon. Anyone who wants to know more about the book, can read about it on our website at: The Purpose Is Profit. About 15 years ago, I realized that one of the purposes I had in my life was to help entrepreneurs start and grow successful businesses. It turned out that Ed McLaughlin had that same goal. So when he approached me to co-write a book with him on his entrepreneurial journey, I jumped at the chance. We have been developing "The Purpose Is Profit" for the past two years. 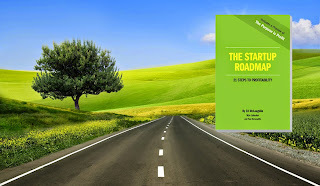 In the process, we realized that we had the makings of a separate book, "The Startup Roadmap." In writing and publishing "The Startup Roadmap," I feel that I am realizing this purpose. I want to share the knowledge with as many people as possible. If you've been thinking of starting a business, I really hope you'll read "The Startup Roadmap." I have not been writing this blog on a regular basis because I've been busy writing a book entitled, "The Purpose Is Profit: The Truth about Starting and Building Your Own Business." 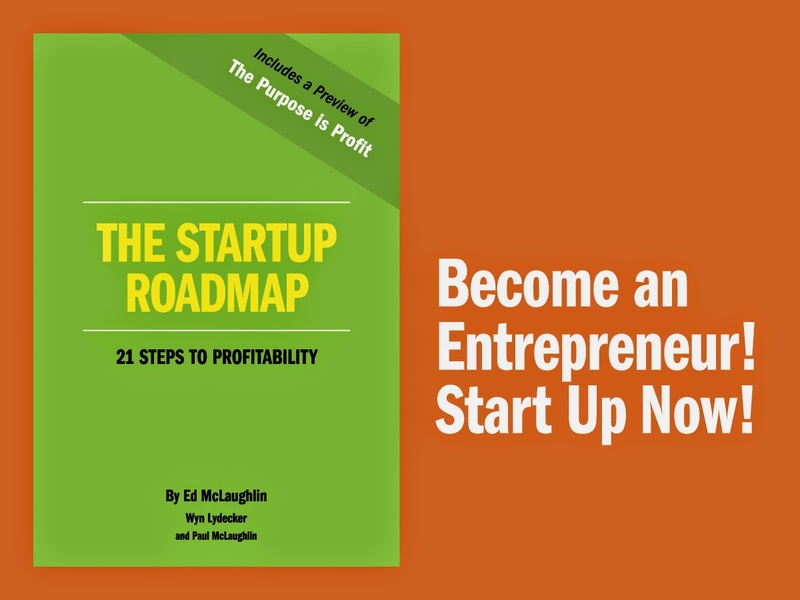 In the process of developing that book, my co-author, Ed McLaughlin, realized that we had the material to create a separate book-within-the-book that we titled "The Startup Roadmap: 21 Steps to Profitability." We then took the time to publish The Roadmap separately while we were finishing the editing and design stage of "The Purpose Is Profit." Here's the upshot: although I have been a freelance writer for over 30 years, I have finally joined the ranks of published authors. We have just released "The Startup Roadmap: 21 Steps to Profitability." The book is a succinct guide for anyone who is thinking of starting a business of any kind. Thinking through the 21 steps will help you with the mechanics of planning, launching, and running your venture. Ed took his experience of bootstrapping a business, growing it into an Inc. 500 company, and selling it to a Fortune 100 company and put it into the steps in "The Startup Roadmap." I've contributed my 20+ years of mentoring and consulting with entrepreneurs and 15 years of writing successful business plans. Together, The Roadmap is chock full of information to help you as you start up. If you need to write a business plan, you can use our book as an outline to help you craft the plan. The value is in answering the questions we've posed and thinking through each step as you plan your business. There has been a movement away from planning. But after working with entrepreneurs before and after the dot-com meltdown, I've learned that the people who plan and execute their plan have been the most successful. 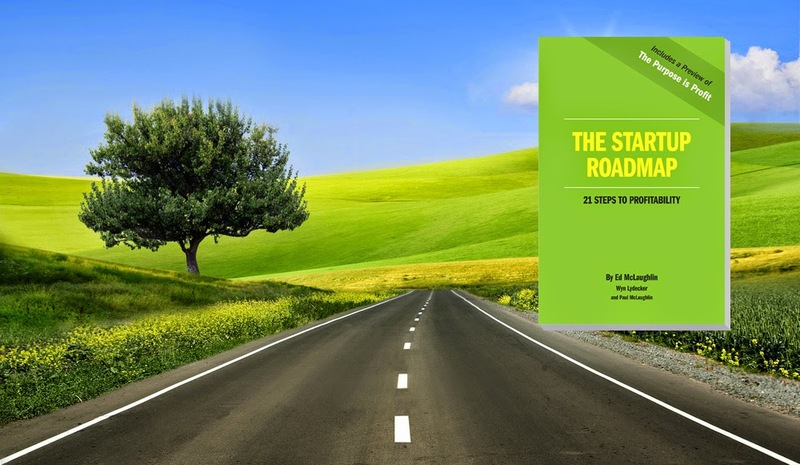 "The Startup Roadmap" is available as a complementary PDF from our website. (Click here to get to the Offer.) Or you can purchase the print edition on Amazon for $9.99. It's a small book, but it's packed with powerful information. Please let me know what you think of our book. Email me at upstartwyn@gmail.com. If you have the time, we'd love for you to write a review on Amazon. Or you can contact ed at: ed@thepurposeisprofit.com.